Normally, when banks look into merging, the impetus is either opportunism, whether well informed or not, or desperation. The only thing that differentiates the possible combination of Deutsche Bank, long the sickest man of Europe, and not all that healthy Commerzbank is that the desperation isn’t driven by the usual urgency, that a bank is about to keel over, unless, as some wags speculate, Deutsche’s first quarter numbers are coming in so bad that the bank needs to have some of credible plan to Do Something before it announces the results. One commentor at the Financial Times reported that “DBK was and is having trouble with wholesale funding spreads widening very strongly.” That suggests that the German giant, after so many years of limping along, may be too close to a tipping point for the officialdom to sit pat. 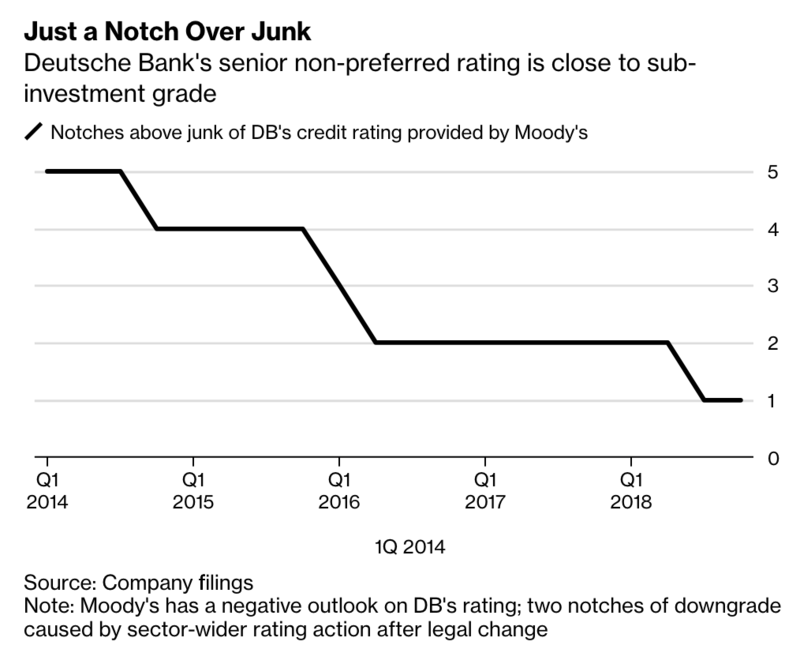 For Deutsche Bank, the urgency to address the situation is exacerbated by high funding costs and the risk of a credit rating cut. Chairman Paul Achleitner is said to see an expansion of Deutsche Bank’s retail deposit base — which Commerzbank would bring — as one way to lower funding costs. Germany is a particularly difficult banking market. Readers may recall how Michael Hudson, in his classic article From Marx to Goldman Sachs, pointed out how it had been inconceivable to Marx that finance-oriented capitalists would win out because their way of operating was harmful to manufacturing. Germany embraced an industry-oriented approach to capitalism, while Britain sought to be the world’s banker. Hudson argues that an unfortunate and not widely recognized outcome of Germany’s defeat in World War I was it helped advance finance-oriented capitalism into a dominant position. While I can’t prove it (and I hope those who know the German banking market better will pipe up), some of the difficulties Deutsche and Commerzbank are suffering appears to be the results of Germany being ambivalent about bank profits, as in on some level (and perhaps explicitly in some circles) seeing them as a drag on commerce if they rise above a very modest level. The reason I suspect this is that when I worked with the Japanese, who are also strongly mercantilist, manufacturing-oriented, banking profits were seen as a bad thing. Japanese banks had fabulously low returns on assets by global standards and were extremely lean. Sumitomo Bank, which was a bad boy by seeking to be Japan’s most profitable bank, was pretty close to Citibank in total assets, had half as many foreign branches and about 2/3 as many domestic branches. In the mid-1980s, Citi had over 100,000 employees. Sumitomo Bank had 16,000 and was planning to reduce the number to 14,500. Germany’s Landesbanken have government backing and their Sparkasse purportedly are not profit oriented. The fact that most advanced economies feel the need to at least one bank as a serious international player is undermined by the big banks having even more difficult-than-in-other-countries competition for retail deposits. By bowing to officials’ desire to forge a durable German lender with global reach out of two troubled firms, Deutsche Bank’s leaders are hardly putting their woes behind them: massive job cuts, political turbulence, a weakening European economy, U.S. probes into its dealings with Donald Trump and a herculean integration – not to mention skeptical clients and investors — lie ahead if they reach a deal. That does not excuse Deutsche Bank having long been spectacularly mismanaged. It’s been operating under what amounts to regulatory forbearance since the crisis, with capital levels way way below any other big international bank. But Deutsche is the classic “too big to fail” bank. Whether it is too big to bail is debatable, but the EU’s new Banking Recovery and Resolution Directive, which banking experts almost to a person declared to be a horrorshow, was supposed to end bailouts and force bail ins….refusing to recognize that that’s a prescription for bank runs. And even though Deutsche is very much the German government’s problem, as readers no doubt have figured out, German politicians hate fiscal spending and stealth monetization of spending. So until there is a crisis to force their hands, they are allergic to providing official support to Deutsche. The long-mooted idea of merging the two has been met with stiff opposition from the bank’s influential unions, and scepticism by five of Deutsche Bank’s top six shareholders, who fret that it may derail the lender’s internal restructuring. Among the few clear supporters of a deal are Paul Achleitner, Deutsche Bank chairman, Martin Zielke, Commerzbank chief executive and private equity fund Cerberus, one of the biggest shareholders in both lenders. Deutsche Bank management had previously been resistant to a merger, but lacklustre performance, combined with the prospect of lower-for-longer interest rates and pressure from the German government to address the lenders’ bloated costs and measly returns, triggered a rethink. Of course, the reason for having to resort to Commerzbank is no major international bank would be saddled with a garbage barge like Deutsche. It’s not just that it’s hard to see why any bank that wasn’t subject to German political pressures would even consider this idea; their regulators would nix it directly or kill the deal by imposing insurmountable conditions. The nominal excuse for the deal is unpersuasive. The claim is that cost-cutting efforts at both banks have not gone deep enough, and the only way to cut further is to merge. I am admittedly generalizing from the US, but we have had far more bank consolidation than anywhere in the world. Bigger banks are not more efficient. Even if there are theoretical economies of scale in funding and in certain lines of business, they are often not realized. On top of that, there are diseconomies of scope. For instance, it’s clear that one of the hoped-for sources of cost savings is branch consolidation. But the US experience is that this is often a fail. Even when branches seem to overlap, customers don’t like it when their favorite branch disappears. More customers than the banks expect leave. The employees’ union expects that up to 30,000 jobs would be axed if the merger went through. A common pattern with US bank deals is that the combined makes cuts that the separate banks could have made but didn’t. One wonders here if a reason for the transaction is to bulldoze labor organizations. They estimated that while annual costs would fall by €2.3bn, a deal would trigger revenue losses of around €1.5bn because of clients moving business to rivals to maintain diverse banking relationships. The big banks have totally lost control of their IT estates. They have no consolidated idea what their installed assets are and what they do. I was on a conference call yesterday which managed to finally conclude — after 9 months and I am not kidding — definitively that an application was really still needed (it had been targeted for possible decommissioning). We bought a US bank’s UK book for a specific retail product two years ago. With a lot of luck we’ll be able to do a very soft launch post migration onto our hosting (and there was the distinct advantage that we shared the same hosting platform and suppliers) in another six months. Full migration might, just might, be completed in another 18 months. The budget for the migration programme is £1.9bn. For one bloody product book. Bog standard vanilla consumer lending product lines. And we had to take an axe to a lot of the US bank product offers. DB and CB would burn through their entire shareholders’ equity before they even got half way through. So, COO Kim Hammonds is leaving Deutsche Bank. Less than a month after describing Deutsche as, “vastly complex,” the, “most dysfunctional place she’s ever worked,” and in the middle of a, “difficult transformation,” Hammonds has left, “by mutual agreement with the supervisory board.” She was, “a breath of fresh air,” according to the chairman. In some ways, however, Hammonds does not seem to have been fresh enough. Hammonds’ key task at Deutsche Bank was to streamline the bank’s unwieldy array of operating systems. When now ex-CEO John Cryan presented his “Strategy 2020” plan in October 2015, he expressed his intention of eliminating 6,000 Deutsche Bank contractors and cutting the bank’s operating systems from 45 to four. Two and a half years later, Deutsche still has 32 different operating systems, and the contractors we spoke to complained that the bank has become “toxic” to work for. Lots of ugly detail for those of you who like that sort of thing. If nothing else, this merger will be a full employment act of German bank consultants who can take the pain of working on such a mess. But even from this remove, it’s obvious that the effort to prop up zombie-in-the-making Deutsche is running out of tricks. This will end badly. The only question is how quickly that becomes undeniable. Right. I am not German but Dutch, and these two countries are geographically and spiritually close enough to share opinions on lots of things. There exists a quite widespread sentiment here that “banks do not make profits, they steal somebody else’s profits”. The idea being that *real* profits are generated in a *real* economy where *real* things are done, built, manufactured and dug up. This in contrast to a “financial sector” leeching off the money streams that inevitably exist in the real economy, only to create pseudo-profits that more harm than benefit said real economy. Personally, this view to me does not seem too far-fetched. But then, I’m not a banker. I’m not a banker either, but sometimes I want to eat one. Great comment. Banks dont make profits. They make rents. DB needs to become smaller, not larger. Few years back, it was talking about selling its US equity business, no idea why that fell through. That IMO should be really the first step, not any sort of mergers. There was an excellen article by somene, maybe even the ex-CEO of DB on its IT woes. IIRC, it was basically that the whole stuff was a collection of fiefs that were built in the last two decades, where the only goal was revenue or day 1 PnL, w/o any idea on what it takes to run the business. I think that sort of “Worry About Day 2 Operations..but never actually do anything about it” is not an uncommon occurrence. My current firm / senior management is trying to un-pretzel their architecture out of a similar (if on a smaller platform) issue that has built up over 10 years. It’s pretty hard to get out of it even with a lot of senior will and money. I can’t imagine it building up over 20+ years! I wonder what DB’s data governance looks like. I bet the now ex-COO wasn’t able to get the existing power-structure slapped around sufficiently to put the control / governance into place so that the architecture could be unwound. If step 1 (Data governance/ control over existing architecture) is impossible, then the rest is just a side-show (I know from current experience). It’s a very common occurence. At one of my previous gigs, the firm struggled with anything new. I actually came up with a framework for them, which included commited revnue for the product to merge to the main systems, and a hard cap on revenue/no of deals until it was done. 15 years later, I just heard from my colleague there that the system I put in to deal with something is still doing it. It seems that the main cultprit is actually not the FO, as usual, but IT, who saw any successfull implementation outside of their process as a direct threat (especially if it was done on a fraction of their budget). That then means you get a lot of small projects, which just get done – because the business has to work, after all – but never rolled into anything as the IT dept is constitutionally unable to do so due to its internal politics. On your other point – well, to have some data governence, you have to know what data you have, and how it works. W/o that, you’ll never get there. Same goes for architecture. It’s one thing to draw pretty pictures and boxes to present, but w/o actually understanding what’s there now, and how it can work in the future (and that means not just on a sunny day, but when the midden hits the fan too), then control over the architecture gives you little, apart from some IT guys (and gals) getting to play with new technology to put on their CVs. My last year at a TBTF was working on a project to try and get our arms around architecture standards. It was the first time we had federated the bu based architects. Of course every BU “already had architectural standards”. BU A had a documents store with 8000 entries documenting everything they knew about, BU B had a live, breathing web application that changed weekly as their governance process dictated, BU C had a 22 page powerpoint. That was 3 out of 12 at the table. We took over tracking a global decommissioning initiative. It was basically low hanging fruit to just dump complexity. I found we hadn’t even agreed on what decommissioning meant. Apps that were “decommissioned” 4 years earlier were still live in production because we couldn’t figure out how to comply with regulatory reporting requirements without leaving it up. Another BU decided they weren’t going to try and hit the goal because “they were making money”. It was herding cats. Architects would agree to do something, and go back into their BU’s and get stonewalled or outright directed to not do it. Regardless, it was a worthy effort because the first step in fixing a problem is admitting you have it. My experience is that the IT orgs mirror the BU structure and governance. In three massive banks, I’ve only seen one centrally governed IT group, which very much mirrored how the company was run. It was an acquisition machine and the core merger methodology was to merge onto a common platform. The number 2 exec in the company ran the mergers and was ruthless, the CEO never flinched. There would be no legacy. It failed during the crisis, largely because that strong central governance made fatal business decisions that killed the whole org. So be careful what you wish for. Fascinating and makes perfect sense. One of the UKs largest asset managers comes to mind as an example of the Centralization through IT platform approach. All Investment Banks are to a great degree just franchise businesses. Go and make some money. Here is some budget and some desk space. Buy a computer and get on with it. And they wonder why things sometimes go wrong. I don’t think that the firm would even know the concept. Further to Clive’s point, the group is a carcass for so-called professional services parasites to feast on. When I arrived in June 2016, I was told there well over a hundred systems in use. In essence, whenever some star signing was made, such star was told to go and buy whatever he / she needed. To this day, the IT dysfunction continues. Sometimes, good systems are taken out of service due to cost and ones that can’t work with what’s left are retained. Go figure! In addition to equities, the structured and leverage finance toxic waste should also go. I get the impression that Stefan Hoops, the new head of global transaction banking, will detach bits from Treasury, Markets and Corporate Finance and add them to GTB and make a commercial bank, a new core to the bank. One can expect a pull back from the US, too. The new model is likely to be Barclays plus, i.e. commercial banking with some IB and asset servicing, not a pure commercial bank like Lloyd’s. That new model would make much sense, as DB cannot survive just on commecial banking in Germany (Any plans to do just that would pretty much kill it, as it’s too large to be supported by that), and there’s no reasonable retail play unless it wants to to outside Germany. But it would still require dropping substantial parts of the IB business. I see very little appetite for that..
Amazing! Yves’ post and the various comments make it sound like IT has all the properties of a virus. Almost impossible to cure or expunge when it becomes dysfunctional. Moreover, its components can become toxic and morph into some new form. I can’t wait for AI! To me it’s like accounting or engineering or operations. It’s a reflection of the business. Keep in mind the example above represented a global MNC with 3 distinct credit card businesses, three distinct retail banking franchises, trading in every major capital market, investment banking organized by US, EMEA and Asia, Wealth Management with distinct philosophical differences by geography with core operations on 4 continents. And I suspect this is small time compared to Clive’s experiences. These organizations are too big and far too complex. NC has had numerous posts on how scale drives inefficiency once reaching a certain point. This is 100% the case. The heart of the banking and other IT problems, imo, is this: The people who wrote the original code to perform specific tasks understood, or were advised by people who understood exactly what the task was, what it did, how it fitted into the overall banking process , and what specific process upstream and downstream handoffs were required. Bring in a new generation (or two) of new bankers who assume “the computer handles that” – without understanding the what and why of whatever ‘that’ is. Now you have the problem of not only computer integration, but also the problems of lost competency and lost institutional memory of core banking functions. That’s before taking into account the budget cutting undermining IT departments, creating its own disfunction. imo. Bankers are like puppies and someone else needs to clean up the mess they leave behind. Look at the mess those naughty banker puppies have made, who will clear it up for them? The structure of the Euro-zone meant there was no one to clean up properly after those naughty banker puppies. No wonder DB is in trouble. Speaking with no more qualification than being German, I would not say that banking profits are unwanted in general rather the industry has two or three significant challenges compared to the US. First of all profit margins are very low across all businesses, even favoured ones such as automotive struggle to generate double digit operating margins and a sustained double digit net profit margin outside IT is very rare. Second there is good competition for retail customers and switching banks or keeping several accounts at different banks is very easy. ‘Normal’ banking consisting of debit card, credit card, online banking, wire transfers, ATM service and savings account are available for everyone not involved in personal bankruptcy proceedings free of charge. Hence ‘access to deposit funding’ not making profits is cited as a reason to merge. Interestingly the Sparkassen are usually on the expensive end of retail because they are committed to local branches and good conditions. The third point I would like to raise is more of a probably justified stereotype – Germans do a lot less borrowing than some other cultures see for instance private debt to GDP figures. Where I grew being in debt was considered shameful and everyone tried to pay back their debt ASAP be it 5 Mark for lunch or the mortgage on the house. Other financial sectors, for instance insurance, do very good business and achieve significant profits in Germany. I have read that by the end of 2018 consumer credit and the housing marke were heating in Germany. The Germans have a word for it!